GORGEOUS 2017 BLACK Filly with ROANING!! This filly is a head turner!!! "Adelle" is a True black with lots of roaning in her flanks, white on her tail head, tall stockings!! She is also HOMOZYGOUS BLACK!!! She is sired by Nightime Shiner - 2x world show qualifier in ranch riding, versatility ranch horse show world qualifier, NRCHA world show qualifier in Limited Open Hackamore, and has his AQHA ROM!!! Dam is an own daughter of Blue Duck Okie (LTE $110,000+) !! Fantastic pedigree to go any direction, from ranch horse classes to reined cow horse to cutting!! Adelle has an amazing temperament, absolutely loves people, catches you in the pasture. 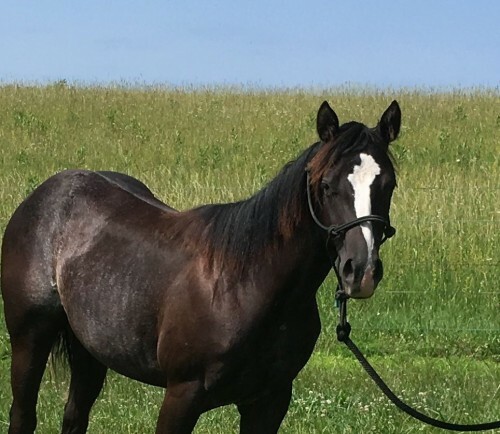 She has great conformation, moves around like a top performance horse prospect should. This gal should go to the show pen, and will be a great addition to someones breeding program later down the road!! !